Laura worked for many years as an actress and model traveling throughout Europe, including living in Italy, Paris and Spain and Japan. Her face has graced the pages of such magazines asVogue Italia, American Vogue, and billboards for such campaigns as Clairol. Her film career began with a guest starring role on the television show, “Matlock” and grew to include roles on popular television shows like “Thirtysomething,” and in such films as “I Love Trouble,” starring Julia Roberts and Nick Nolte. Having loved the art of writing since she was a girl, Laura returned to school to study journalism. After serving as editor of her school paper, the Roundup, for two terms, she quickly obtained the job as associate editor at The Malibu Times, and within six months became editor. With the crew of The Malibu Times newspaper, she co-launched Malibu Times Magazine, an upscale publication depicting the lifestyle of Malibu and surrounding areas. One of her hobbies–dance–developed at the same time as her journalism career, and Laura first experimented with swing, both East coast and West, before becoming hooked on salsa. 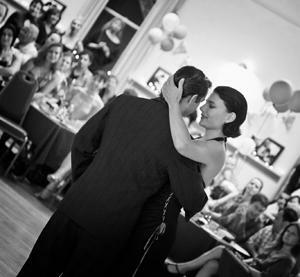 She soon fell in love with the wonderfully, romantic and sensual dance of Argentine tango. Traveling to Buenos Aires, Argentina to study with teachers there, and to dance the nights away, Laura soon met Orlando Paiva Jr., with whom she studied, assisted teaching and performed for many years. Laura is the co-founder and co-producer of Tango Masquerade, a three-day International Halloween Tango Festival in Los Angeles that hundreds of tango lovers from throughout the world attended. In addition to publishing the newsletter Coffee & Tango, Laura designed and published Tango Masquerade Magazine and created the Web sites www.coffeeandtango.com, and www.malibutimesmag.com. Laura has also launched her new business, crackerjackscribe.com, social media and content marketing agency, as well as deliciousvoyages.com, a travel and dining web site. Laura’s future endeavors include continuing her work as a journalist, and continuing to spread the art of Argentine tango through such endeavors as the Coffee and Tango newsletter and this Web site.